This had a strange shape to me, the outer leaves grew downwards and I had pulled them over the sides when they got bigger, but the cats ate it! I saved the centre bits and replanted. 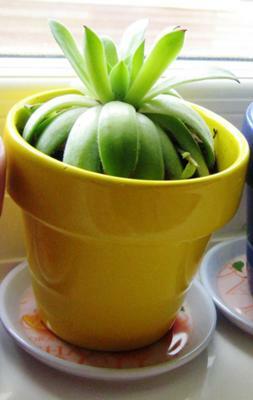 I hope it grows again, as it was a most splendid shade of green. One of the reasons I have been having a hard time identifying these is because of the leaf shape. Many of the websites I came across had colourful leaves that were either more rounded or triangle shaped. And these are quite longer leaves, ending in a point. If that makes any sense! There are many different characteristics that go into identifying Sempervivum. They are all so different and change with the seasons, and with different growing conditions that it's impossible to pin down exactly which variety you have. In every collection there will always be NOIDS, or No Id types. I use these for succulent crafts, and don't worry about the correct name for them. I would be concerned about your cat eating them. 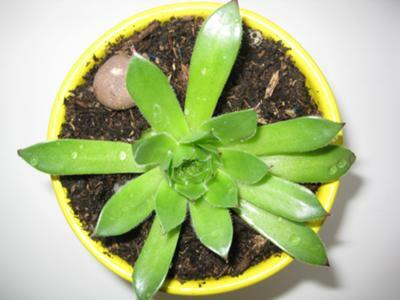 See the page on poisonous succulent plants for more information. Have a look at Droopy Drawers Sempervivum for information on why the lower leaves are tending to aim downwards. Thank you for your concern! So caring! *awesome* Kittie is ok, definitely, I doubt he swallowed anything...just maimed it mostly. He has cat grass, but apparently felt this was a new toy; whilst his brother has no care for any of my plants! Hi Annalisa, glad to hear your cat is okay. Some cats are worse than others for 'tasting' things they shouldn't.